What happens when a blue and white horizontal striped 3/4 sleeves shirt meet some red zippers? I've got inspired by this shirt, got to my sewing machine and make it happen. I ended up making something slightly different, by sewing another zipper on the side, and since my shirt had buttons on the shoulders (originally blue) I just change them in red. * 2 metal teeth red zippers about 7"
That punch of contrasting color is really cool on the sleeve - and I like that you added that additional zipper on the side! I've got the red fever lately!! thanks ladies!! That turned out really well - I love the colour combination. Zips have always kinda frightened me but maybe I should give them a try. 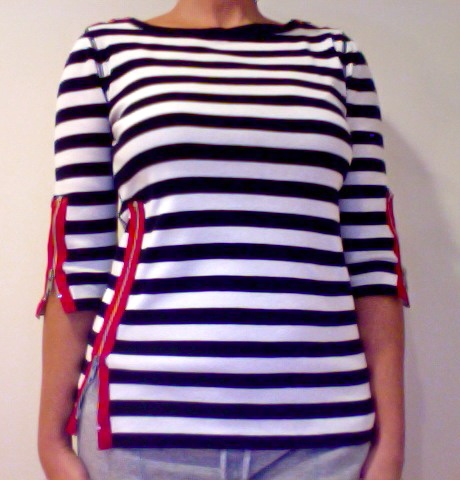 I worn it once and got lots of compliments... give zippers a try, definitely!!! I like your shirt better! Love the red zippers! Have been refashioning some of my wardrobe and this looks like an easy do! it's a quick fix and gives ton of compliments! what not to like? Cute. Love the color combo. I did'nt realize I have a thing for zippers but I love this idea too. Now I can't wait to get to the fabric store and buy my zippers. zippers are addicting, be conscious!